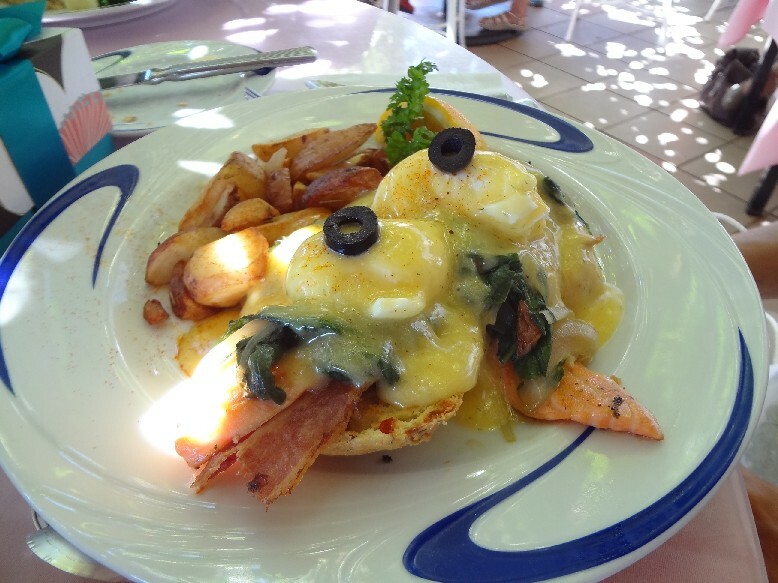 Since Hau Tree Lanai is famous for their eggs benedict, Mom ordered the Salmon Benedict Florentine ($17.00), a variation of the eggs benedict but with salmon, spinach and egg over cheese scones. Yum! 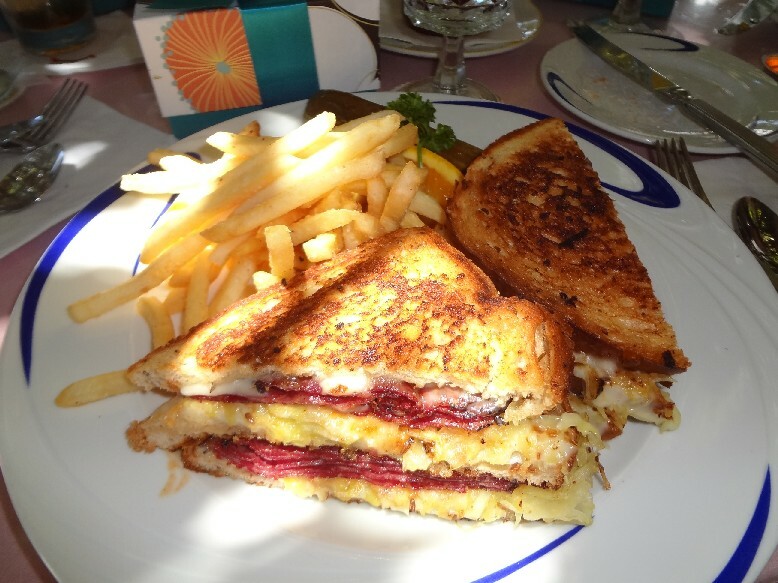 and I had the Reuben Sandwich ($16.00) with pastrami, saurkraut and swiss cheese on rye bread served with french fries. 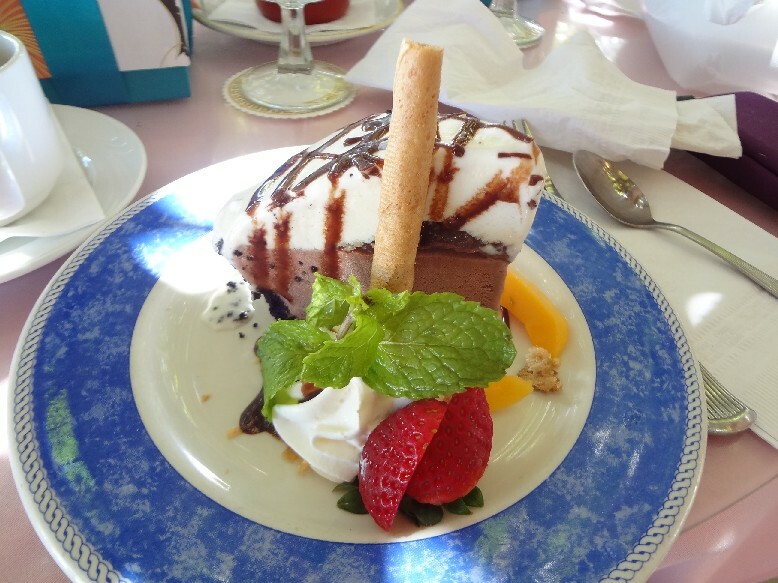 and for dessert, I had the Mauna Kea ($10.00), an ice cream pie inspired by the snow capped volcano with layers of haupia ice cream, fudge, mac nuts, chocolate ice cream on top of an oreo cookie crust. This was sooo delicious. 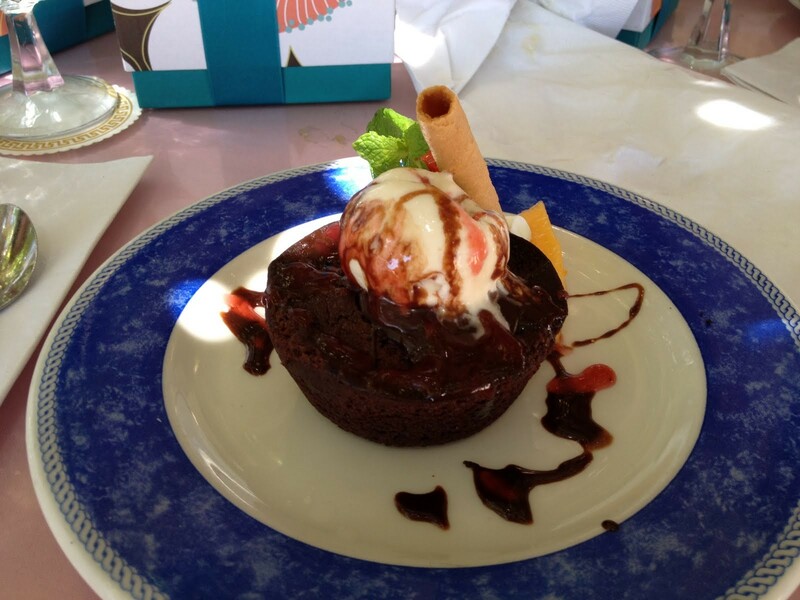 The Warm Chocolate Lava Cake ($10.00) with ganache filling. The outdoor location overlooking the beach under the large hau tree is so charming, it was the perfect setting for a relaxing lunch with my favorite ladies. MENU: View the menu on their website. 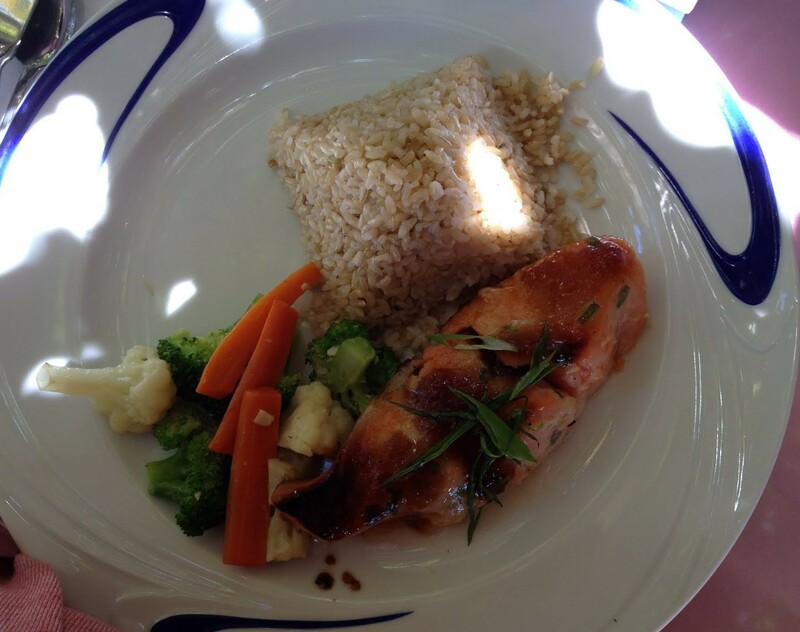 We’re enjoying getting to know our new Kapolei neighborhood, one meal at a time! Breakfast is my favorite meal to eat out and Koa Pancake House had been on my mind since I kept hearing about it and seeing it all over. There are currently 7 locations on Oahu, including one in my new neighborhood of Kapolei, much to my delight. Since moving here a month ago, I’ve already eaten there twice. 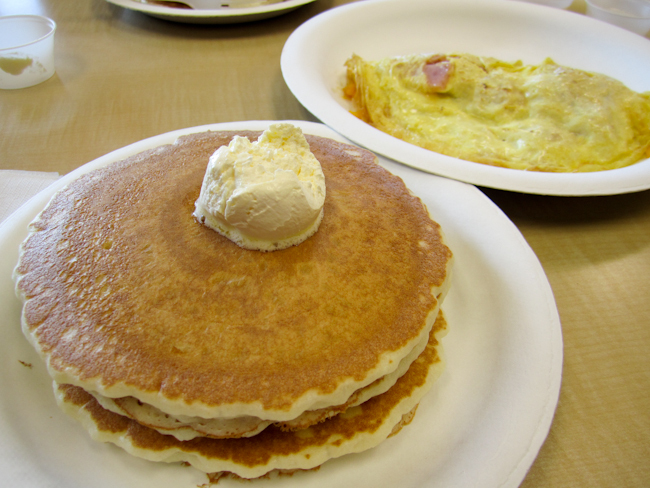 Simply put, Koa Pancake House is cheap, fast and casual. Which is perfect because who wants to spend lots of $ on breakfast, and who wants to get dressed up first thing in the morning? At Koa Pancake House, you won’t find fancy china (it’s all paper plates and plastic utensils) or fussy service (you order at the counter) but you can stroll in with yoga pants and slippers and enjoy a satisfying breakfast. The menu is simple, consisting of savory breakfast classics (omelettes, eggs and various meats) and sweet classics (pancakes, waffles, and crepes). Yes, they have crepes!! They also have loco moco, eggs benedict, and a pretty standard lunch menu. Here’s the Ham & Cheese Omelette ($7.50) which includes a short stack of pancakes. 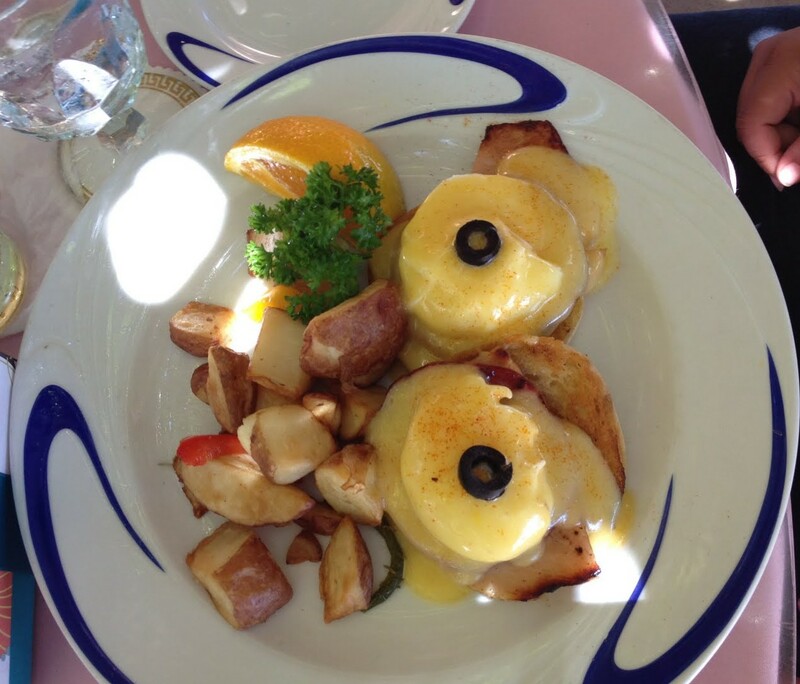 All omelettes and egg/meat entrees include your choice of rice, home fried potatoes or pancakes. The Denver Omelette ($7.95) with ham, bell pepper, onion, with pancakes, and side order of Fried Rice ($2.95). 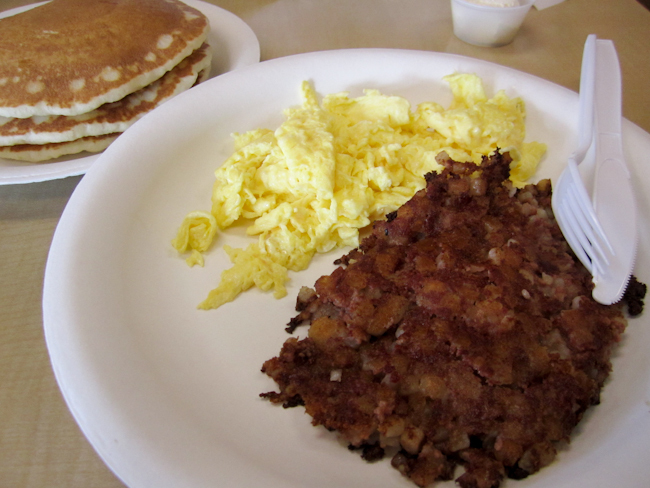 Corned Beef Hash & Eggs ($5.95) with pancakes. 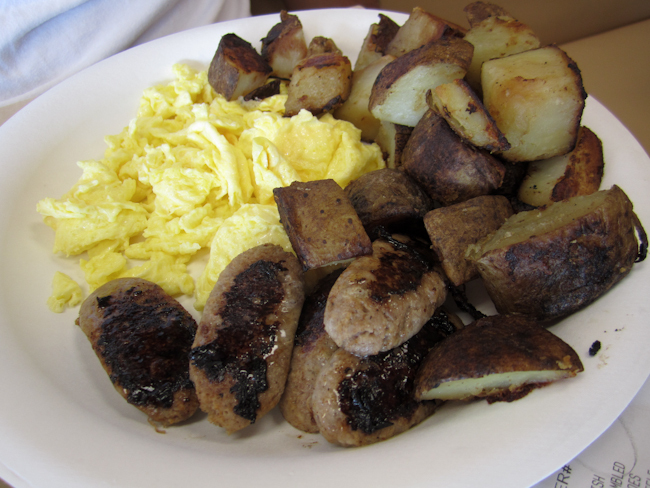 Scottish Bangers & Eggs ($6.25) with home fried potatoes. Bangers are basically thick sausages, served sliced and grilled here. Waffles with Strawberry & Whipped Cream ($6.50). Coffee is only $0.95 and a small orange juice is only $1.00 y’all! Honestly, the food is pretty average. The pancakes and omelettes are nothing you can’t make at home, and the corn beef hash is probably the canned kind, but that’s OK by me. Breakfast is one of those meals that tastes good no matter what. To me, there’s something about going out for breakfast that’s special, because it usually means that it’s your day off and it signals the start of a whole day that you get to spend with the people you love. You could say Koa Pancake House is a favorite date spot for my husband and I.
I’ve been feeling better and have a little more energy these days. 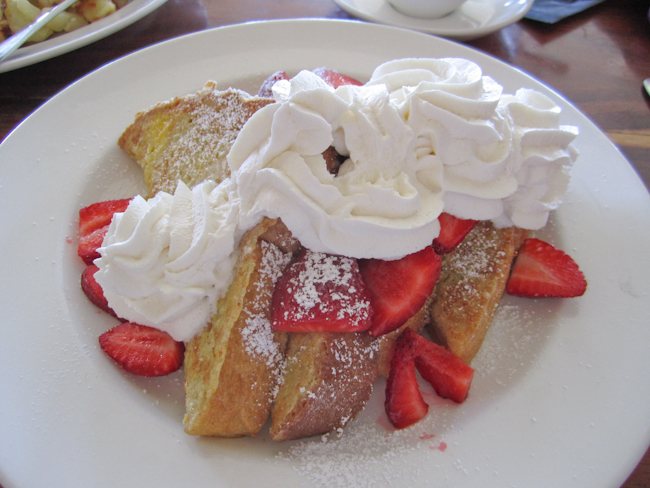 To indulge my craving for waffles with fresh strawberries and whipped cream this past weekend, Hubby and I headed out to enjoy a leisurely breakfast at Longhi’s. 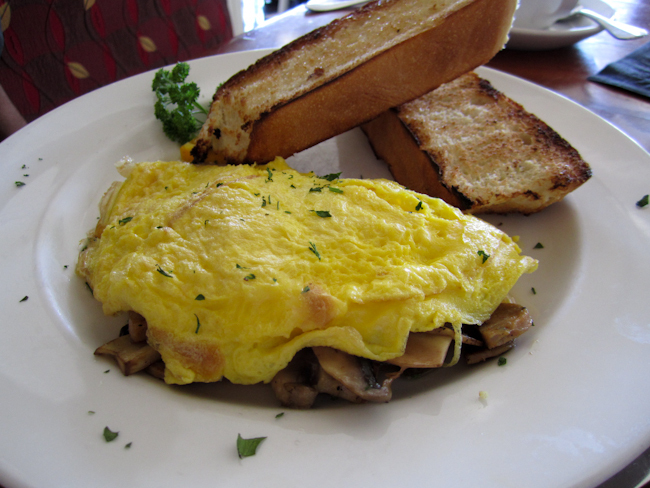 And Hubby ordered a Mushroom, Swiss and Sausage Omelette served with toasted baguette. Plus a side order of Home Fries with Mozzarella Cheese on top. 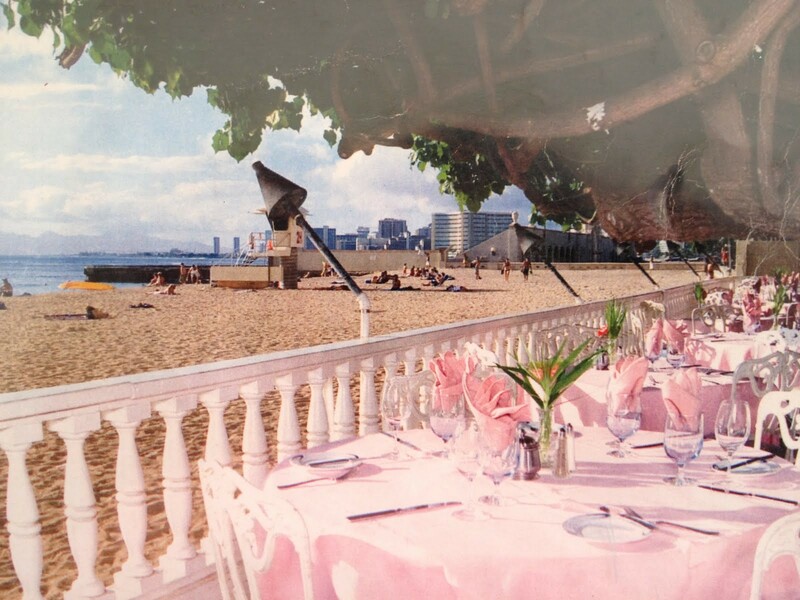 Honolulu was blessed with absolutely gorgeous weather over the Memorial Day weekend and the open air dining room with its gorgeous views made Longhi’s the perfect place to start off our day. 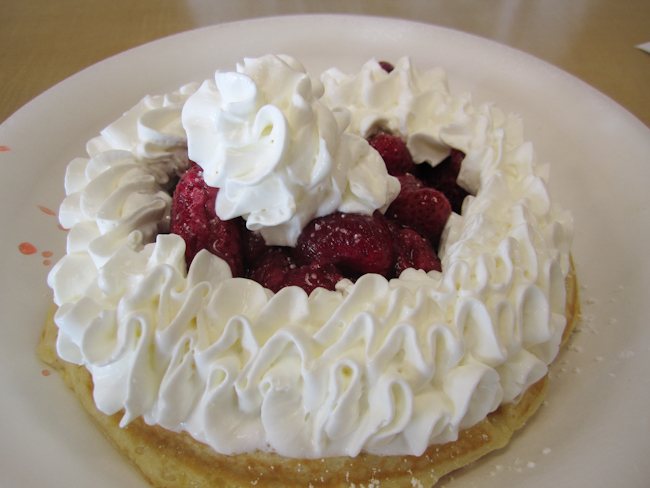 They’re also one of the few places that serves REAL whipped cream and REAL maple syrup with their pancakes and waffles. 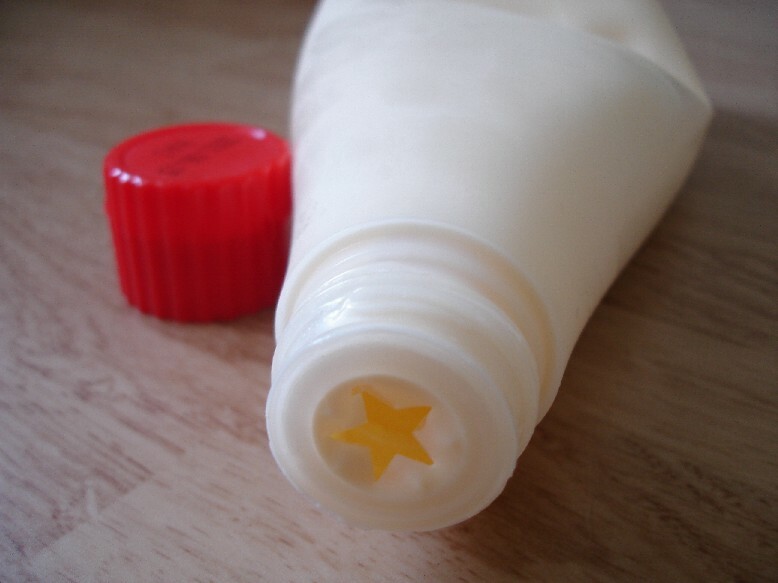 Important details that make all the difference! 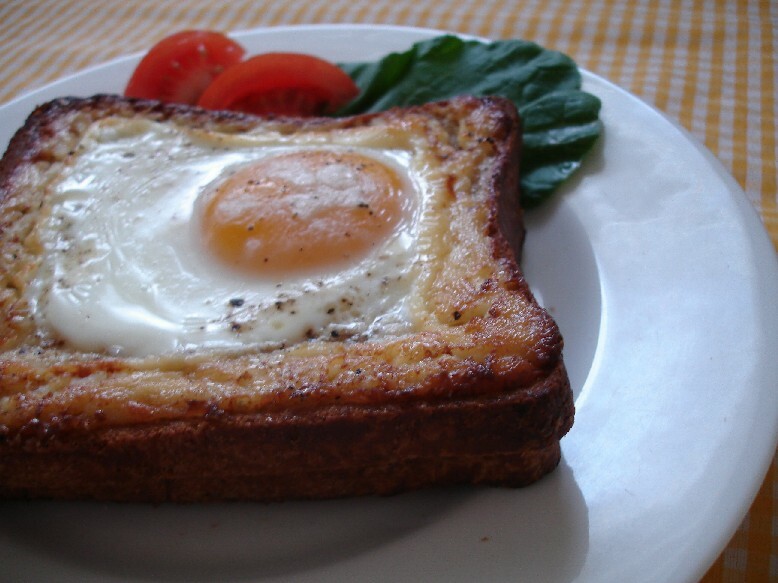 My favorite egg+bread combination in the whole wide world: sunny side toast. 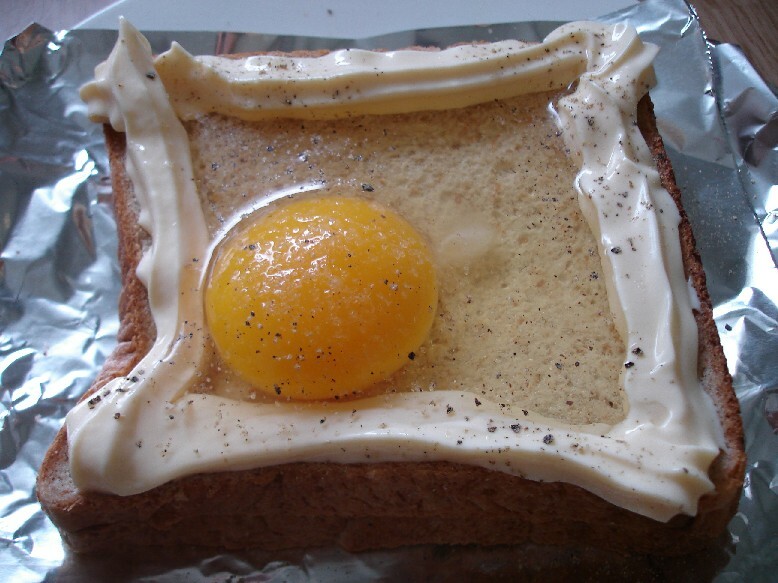 Simply create a border around the edge of the bread with mayonnaise (it has to be Japanese mayo in a tube so you can squeeze out the border), crack an egg, salt and pepper, and pop in the toaster oven or oven for 10-15 minutes. I’m off to the airport now to pick up my mom and her sister who are flying in from Japan for a week long visit. So excited! Hubby and I flew to Maui this past weekend to spend the day with my father-in-law (FIL). We took an early morning flight and kicked off our day with an early birthday breakfast for FIL at Gannon’s Restaurant in Wailea. 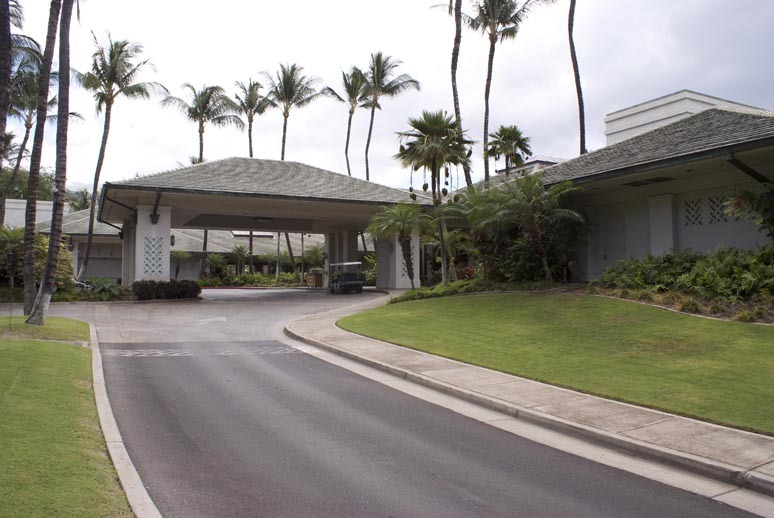 Gannon’s is the namesake and one of three restaurants owned by acclaimed chef Bev Gannon, one of the founders of Hawaii regional cuisine. 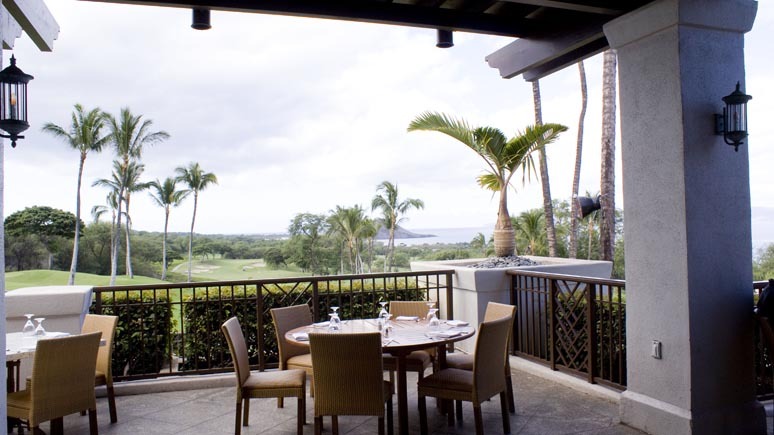 Located inside hillside Wailea Golf Club, the restaurant has million dollar views of Molokini and Kahoolawe across the ocean. The gorgeous views from the open air terrace immediately put us in vacation mode for the day. 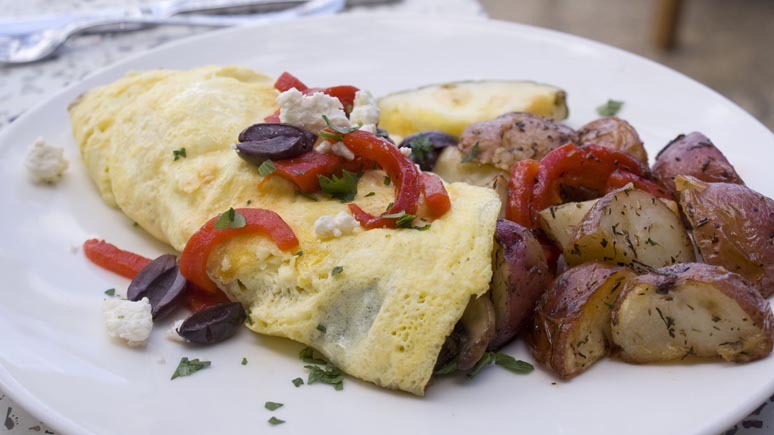 FIL ordered a Greek Omelette ($11.00) filled with spinach, feta cheese and kalamata olives and comes with roasted potatoes and choice of toast. 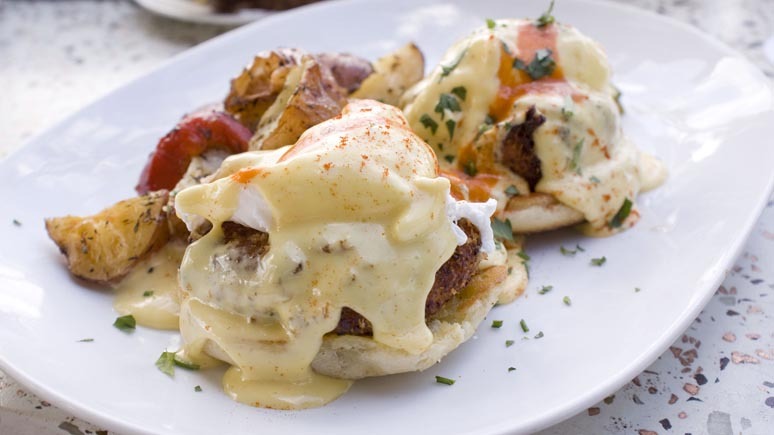 I ordered the Crab Cakes Egg Benedict ($14.00) and shared it half half with FIL’s omelette. Hubby had the Loco Moco ($12.50) but got his eggs scrambled instead of sunny side up. 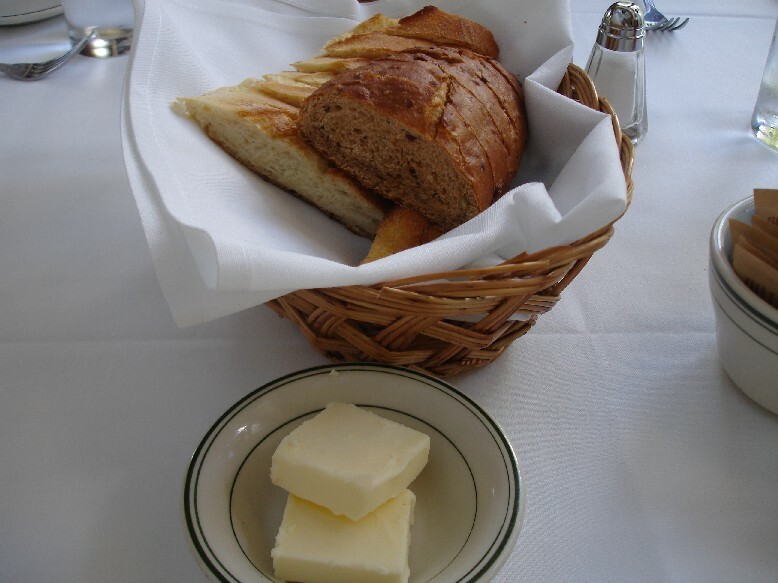 The food for breakfast is pretty standard stuff, but the prices are reasonable and the view is so luxurious that I would recommend it for anyone vacationing on Maui. With a big beautiful full bar, they’re also open for lunch and dinner and FIL says that their happy hour deals are awesome. MENU: Click here to view the menu on their website. 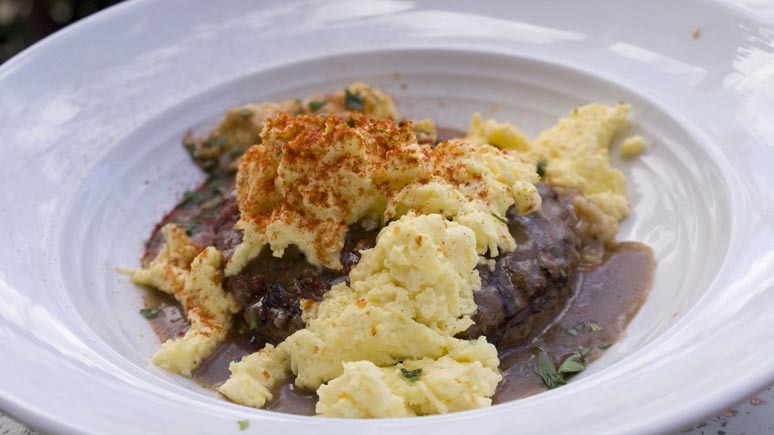 Did you know they serve brunch at Wolfgang’s Steakhouse? I met up with some friends this morning for a very filling Sunday brunch. 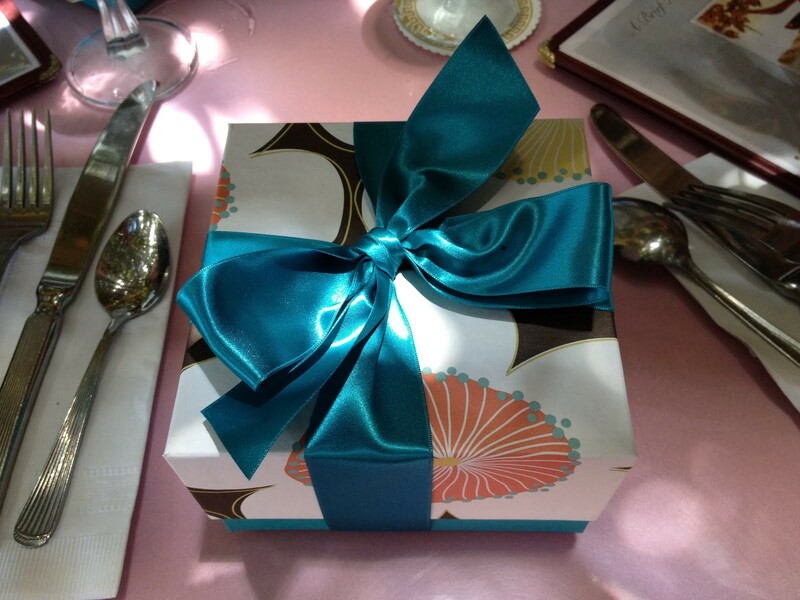 They also have their regular lunch menu too but the brunch menu is reasonably priced and filled with classic brunch favorites with a steakhouse twist like oysters on the half shell, shrimp cocktail, eggs benedict with filet mignon, waffles, mimosas, and bellinis. 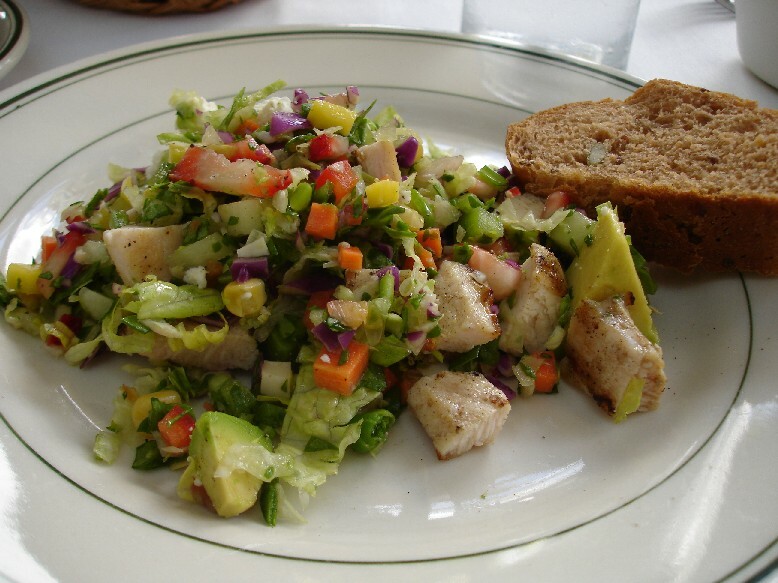 Here’s the bread basket and my portion of the Tropical Summer Salad ($12.95) from the summer special menu, filled with colorful pieces of strawberry and mango. 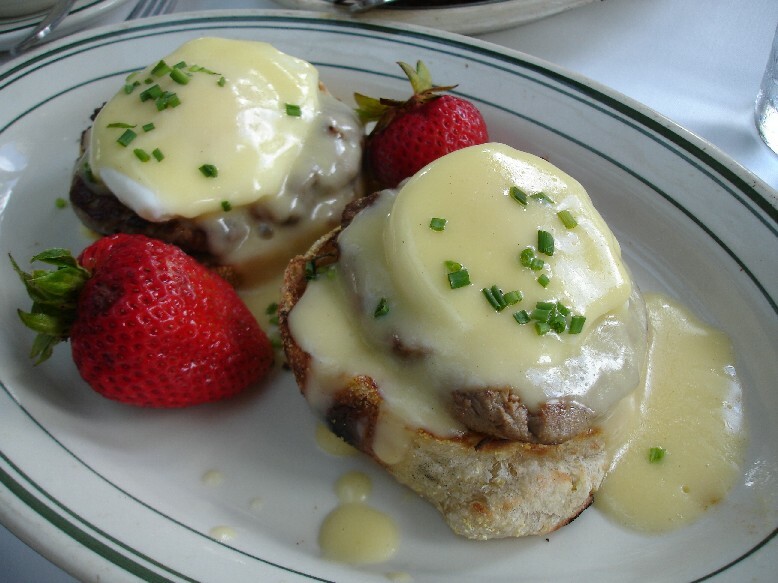 Wolfgang’s version of Eggs Benedict ($12.00) with filet mignon instead of Canadian bacon. 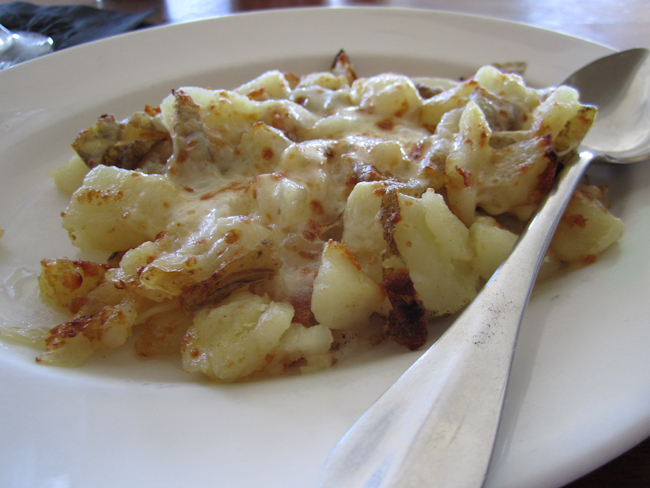 By the way, all brunch items are served with a side of German potatoes. 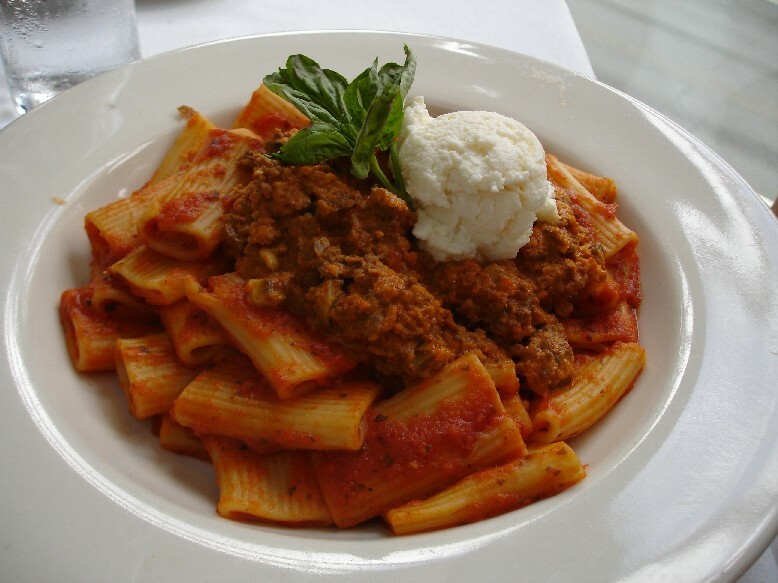 Rigatoni Bolognese ($16.00) with a super chunky meat sauce and big scoop of ricotta cheese. 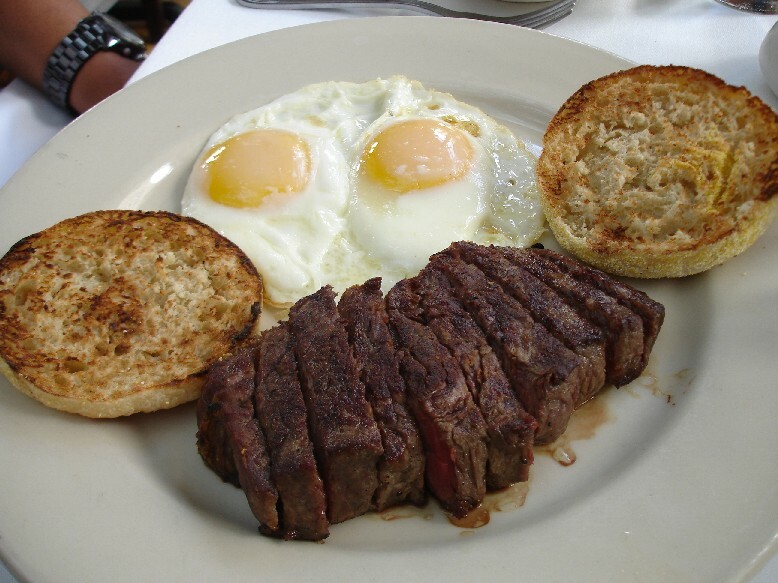 Dry Aged Sirloin Steak and Eggs ($24.00). MENU: Read about happy hour at Wolfgang’s on a previous post here and view the menu on my original post here. 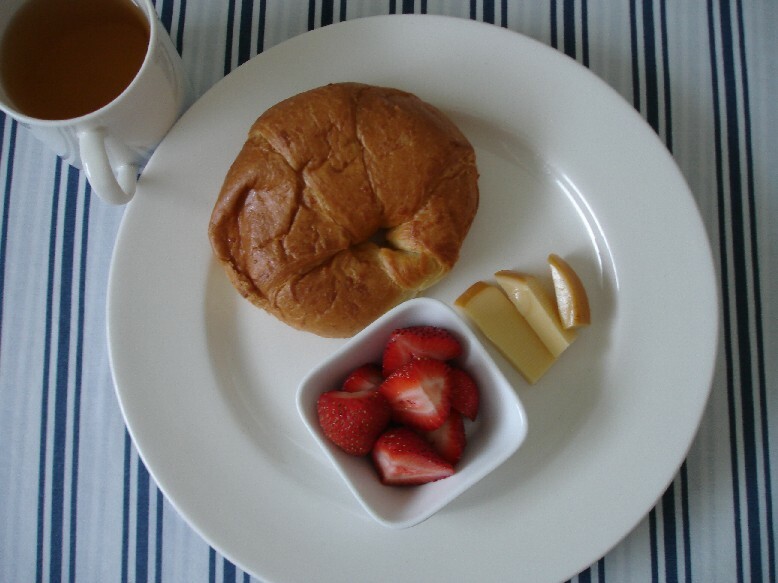 Strawberries, a little smoked Gouda cheese, and delicious butter croissants from Ba-le Bakery.